Ten companies from the Bristol SETsquared Centre, the Global No.1 university business incubator, competed in an ‘elevator pitch’ to promote their businesses at the Annual Innovation Showcase, hosted at Veale Wasbrough Vizards on Wednesday, the 15th of June. Interactive Scientific scooped a top award for the Best Elevator Pitch, as chosen by the audience on the night. Other pitches included Yellow Dog, last year’s winner, who offer crowdsourced 3D rendering for animators and was pitching for £1m funding, Gradient DM, who have developed the GAPsquare tool for measuring the gender pay gap, and My Action Replay who capture highlights from sporting events, instantly sending edited footage to social media channels and local TV. 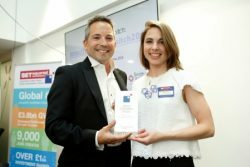 The audience, who voted for the best pitch, was made up of investors, grant funders, senior executives from major corporations, supporters and mentors of SETsquared. 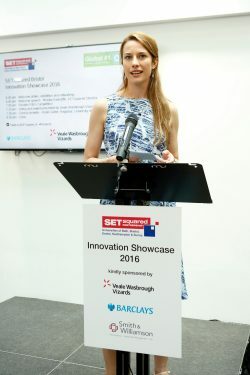 The event was opened by Monika Radclyffe, who was appointed to Centre Director for SETsquared Bristol in March. Monika talked about how all of the individuals gathered at the event are part of the ecosystem fabric and need to remain active connectors and supporters in order to ensure the cluster continues thriving.